EMC Planning Group prepared the Draft CreekBridge II Specific Plan for CreekBridge Homes. 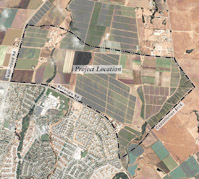 The Specific Plan area included approximately 750 acres of land within the City of Salinas’ Future Growth Area and primarily consists of cultivated farmland and grazing lands. Gabilan Creek riparian corridors run through the Plan area north/south along Independence Boulevard and Natividad Creek riparian corridors run through the Plan area north/south just east of Constitution Boulevard. The Plan area is bound by agricultural lands and the future extension of Russell Road to the north, Boronda Road and a residential neighborhood to the south, Natividad Road to the west, and the future extension of Constitution Boulevard to the east. The vision behind creating the Specific Plan was to develop a traditional neighborhood within the Future Growth Area, while adhering to new urbanism principles. The Specific Plan addressed the community vision, land use plan, development regulations, design guidelines, and implementation measures to ensure development that was consistent with the goals, objectives, principles, and policies of the General Plan. Key issues addressed were circulation, wastewater treatment, water supply and treatment, air quality, noise, and agricultural and biological resources.